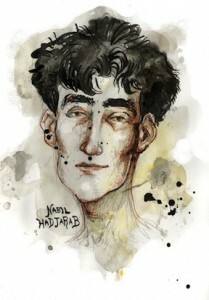 Amantullah, a prisoner at Bagram. Photo by Alixandra Fazzina, from The New Yorker. Estimates are that the United States has detained many thousands of men since 2011 at Bagram Air Base in Afghanistan. Of course, that’s mostly a guess, because they can only be identified when families report them missing. Tina M. Foster and her colleagues with the International Justice Network (ijnetwork.org) have been fighting for years now, for a very basic right for these prisoners: habeas corpus. So far, they’ve been unsuccessful at getting any relief, because the Obama administration holds to the Bush regime’s claim that because the prison is in a (U.S. created) war zone, the prisoners cannot be charged or allowed legal defense, presumably until the war is declared ended. Monday September 16, Tina and colleagues were back in federal court representing three men who are non-Afghans, grabbed by U.S. forces elsewhere and brought to the prison at Bagram. One was 14 years old, and is still in custody at 19. With the U.S. seeking to end its active military involvement in the Afghan war by the end of next year, Swingle repeated the government’s recent claim that it “wants to get out of the detention business” at Bagram. Some of the lawyers for the detainees, however, argued that there is no assurance that the U.S. military would free any of those it is holding there even after the main U.S. military force had departed. The U.S. has built a new prison facility on the air base, and that may not be closed down, according to New York attorney Tina M. Foster, who represents three non-Afghan detainees. Eric L. Lewis, a Washington, D.C., lawyer for a Pakistani national, named Amanatallah, joined Foster in pleading for habeas rights for the Bagram non-Afghan prisoners. His client, Lewis said, was actually captured by British forces in Iraq, and the U.S. military had no reason to ship him to Afghanistan other than to try to keep him out of reach of U.S. courts. The third lawyer on the detainee side, John J. Connolly of Baltimore, brought into Tuesday’s discussion a plea for special favorable consideration of the plight of minors who get caught up in the war on terrorism. His client, Hamidullah, a Pakistani, was only fourteen years old when he was captured. Government lawyer Swingle, in countering Connolly’s argument, contended that the important fact is that Hamidullah is now nineteen years old, and that is what counts in judging the legality of his detention. a Pakistani citizen, a rice merchant, from a village outside Faisalabad. In 2004, he went on a business trip to Iran (which imports rice from Pakistan) and crossed into Iraq to visit Shia shrines. We know that he disappeared and was not heard from for ten months, when his family learned that he had been detained by British forces in Iraq, handed over to American troops, and then flown to Afghanistan and jailed at Bagram. We know that he was registered originally under the wrong name, suggesting that this may be a case of mistaken identity. We know that, for nine years, he has been prohibited from speaking to a lawyer and permitted only a few telephone calls from his family. He has five children who have not seen him for nine years. Why was Amanatullah brought to Afghanistan? Rendition of a prisoner from his place of capture to a third country is a grave breach of the Geneva Conventions, as is rendering someone to a war zone. Surely, there were plenty of places to detain him in Iraq. And there was a well-worn route for prisoners to be sent to Guantánamo Bay. Again, the government will not say. International law says using a child under the age of 15 as a soldier is a war crime, the attorney said, so the United States can assert jurisdiction in Khan’s case. The United States should release all detainees under 18 (including those arrested when they were children) in Guantanamo and Bagram; release those men who have never been charged, and allow the others legal representation. Most essentially, the U.S. should get out of Afghanistan now, not vaguely in 2014, and not in 2024, when the current status of forces agreement matures. Hamidullah was only two years old when the U.S. began this war and occupation. Barack Obama pulled out the “we’re not Big Brother” line again Friday in the ongoing to effort to bamboozle people alarmed about the vast National Security Agency surveillance of whole populations exposed by Edward Snowden. The important thing to him is not that the surveillance is curtailed, but that you feel comfortable with it. 1) a new independent NSA review board that will publish recommendations on protecting civil liberties 2) a new website detailing the surveillance activities 3) changes to the Patriot Act authorizing the spying, and 4) a new public advocate to argue cases in the secret court that grants the NSA spying requests. all these steps are designed to ensure that the American people can trust that our efforts are in line with our interests and our values. And to others around the world, I want to make clear once again that America is not interested in spying on ordinary people. Obama was especially pissed off that Snowden’s revelations continue to be published via Glenn Greenwald in The Guardian, and in other media. These include irrefutable evidence – from the horse’s mouth — of ongoing NSA programs which collect all metadata from very large sections of people, including Stellar Wind, Boundless Informant, and X-KEYSCORE. Nothing Obama announced Friday is likely to materially alter the NSA’s ongoing mass collection of phone data and surveillance of internet communications in the short term. * Legal disclaimer: “Torture” here is defined as anything the United States does not do, and conversely anything the United States does, including waterboarding, forced feeding of hunger strikers through nasal tubes, long-term solitary confinement in U.S. prisons, and the barbaric atrocities at Abu Ghraib are, by definition, not torture, not withstanding any international laws or treaties the United States is party to or has refused to sign. Furthermore, “murder” here is also defined as anything the United States does not do, and again, anything the United States does, including the execution of innocent people, the killing of over 200 children in drone attacks, and the deaths of millions around the world through coups, repression and war, is not murder. gain public trust in the NSA programs and engage in a national debate about surveillance. But he also has said he was comfortable with the current programs. So he could say he spurred a debate and tried to address privacy concerns even if no changes result. The programs themselves are the problem, not whether they are modestly transparent. As long as the N.S.A. believes it has the right to collect records of every phone call — and the administration released a white paper Friday that explained, unconvincingly, why it is perfectly legal — then none of the promises to stay within the law will mean a thing. Obama’s rhetoric rang like the May 23, 2013 address when he said he “wants” to close Guantanamo and would remove an obstacle to prisoners’ release — which he created — by putting a moratorium on releasing prisoners to Yemen. Exactly ZERO prisoners have been released since his comments. 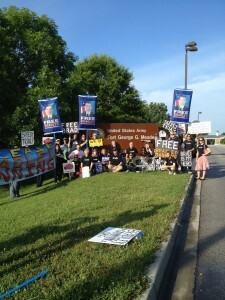 On Monday, July 8, Bradley Manning’s defense began with what was surely one of the most intense and unusual openings in U.S. military or civilian court history. Almost without introduction, the 39 minute version of Collateral Murder was played on five screens, while the military judge seemed to read along from the chilling transcript. The more frequently viewed 17 minute version has the Apache helicopter attack on a group of Iraqis, including a cameraman and reporter working for Reuters. But the prosecution, for unfathomable reasons, insisted that the longer version, which includes another horrific attack from the Apache on an apparently unarmed Iraqi. There were tears in the full court room at all the appropriate points. 25 of Bradley’s supporters were allowed in the public seats at any one time, switching with 52 others who filled the overflow trailer. 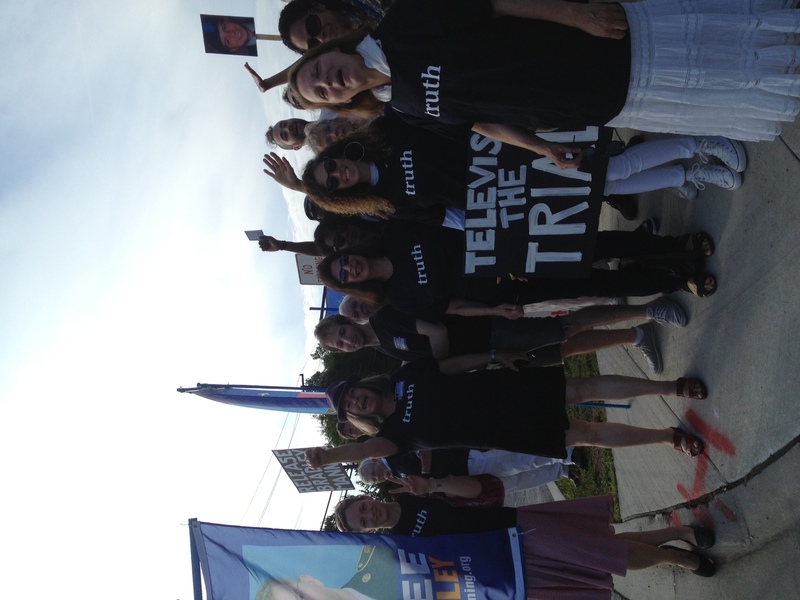 We succeeded in having the largest turnout to date to support Bradley at trial, including many who were coming for the first time, 24 of us from New York. The security detail counted and re-counted, short of badges, nervously herding the overflow. The Collateral Murder footage was what made us support Bradley before we had any idea he existed. On April 5, 2010, when Wikileaks first published the video which they named Collateral Murder, we knew it was a myth-breaker for those who still thought the U.S. was in Iraq to “save” lives and help people. The Standard Operating Procedure of U.S. war-fighting in contested urban areas of occupation came through strongly enough visually. Add in the callous, outrageous chatter of the gunners – which was what Bradley testified this past February caught his attention and horrified him — and you have crimes of war writ large. This footage figures importantly in the U.S. case against Bradley, as they argue he intentionally released it and other material to Wikileaks, knowing it would get into the hands of “the enemy.” But the defense presented testimony that the footage had already been in the public domain, was no longer classified, and that Bradley was not collaborating with Wikileaks, but rather leaked the material to them when other news organizations didn’t respond to his entreaties to publish the real story of the Iraq & Afghanistan occupations. Davis said he had also checked against information provided in newspaper articles, a docu-drama called The Road to Guantánamo and a book, The Guantánamo Files, that was published three years before the WikiLeaks disclosures. He said he had concluded that “if you watch the movie, read the book and the articles, you would know more about them than if you read the detainee assessment briefs”. Davis testified that the DAB’s were almost useless to the prosecution, because they were so hastily and casually constructed. We learned Tuesday that the five DAB’s picked out by the prosecution — although of course this was all kept secret in the courtroom — included Shaker Aamer. Aamer is outrageously, still at Guantanamo after eleven years, although he was cleared for release by Bush in 2007, and again in 2010. Three others were members of the Tipton 3, featured in the film The Road to Guantanamo, who got out years ago, and in our friend Andy Worthington’s book. None of the erroneous and incomplete information gathered by US intelligence years ago could have any relevance now compared to actual journalism. The Justice Department has an ongoing grand jury investigation into Wikileaks and Julian Assange, and an active interest in the case against Manning, as a route to potential prosecution of Wikileaks. 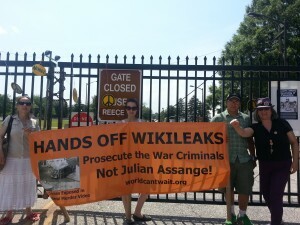 There was testimony today by defense witness Harvard professor Yochai Benkler who contends that Wikileaks is a legitimate news organization, thereby entitled to First Amendment protection, and not “the enemy” Manning is charged with aiding. What happens here will create precedent for pursuing future whistleblowers or leakers. Depending on how WikiLeaks ends up being cast in the ruling, it may become a factor in how the US government continues its investigation and potential indictment of WikiLeaks editor-in-chief Julian Assange, WikiLeaks staffers or volunteers connected to WikiLeaks. The defense rested on July 10, after ten witnesses testified. The court martial resumes at 3:00 pm Monday July 15, with more motion arguments, and an expected rebuttal from the prosecution. There may be more from the defense before the Judge announces decisions on the 22 charges. Then the trial moves to the sentencing phase, which will likely involve weeks more of arguments. 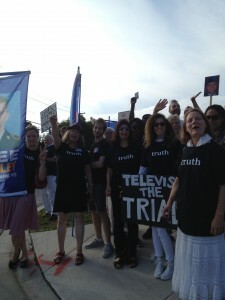 Stay tuned for another call-out for maximum support at the trial. Coverage from Associated Press and The New York Times has been occasional. 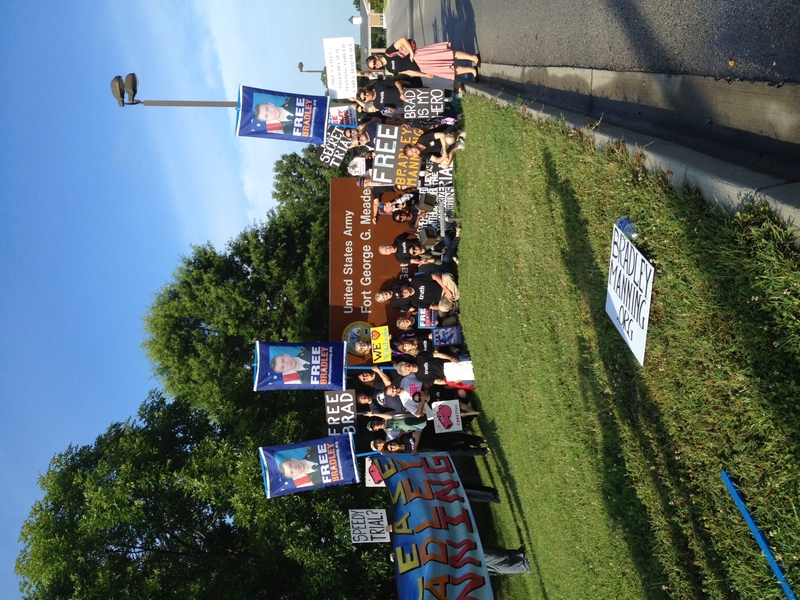 Saturday, we gathered at Ft. Meade for the largest support action for Bradley Manning during the three+ years of his imprisonment before trial. 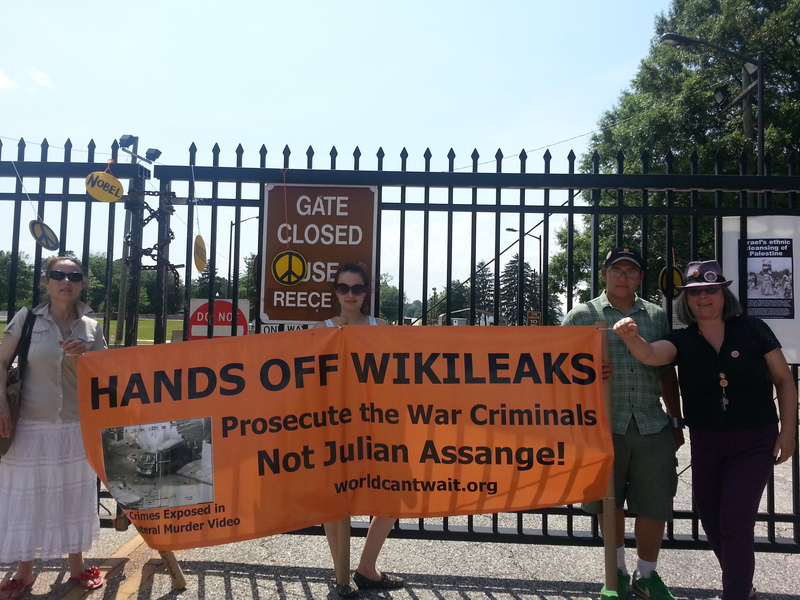 I saw MANY subscribers to the World Can’t Wait e-newsletter list, donors to the recent New York Times “Close Guantanamo” ad, activists from years of opposition to U.S. wars, and younger people who have come forward mainly because they are inspired by the integrity and honesty of Bradley Manning. “I also recall that in early 2009 the then newly elected president, Barack Obama, stated he would close Joint Task Force Guantanamo, and that the facility compromised our standing over all, and diminished our, quote unquote, “moral authority.” After familiarizing myself with the DABs, I agreed…. “It is fair to call what is happening to Bradley Manning a “show trial.” Those invested in what is called the “US military justice system” feel obliged to defend what is going on, but the rest of us are free to describe this travesty for what it is. No serious commentator has any confidence in a benign outcome. The pretrial hearings have comprehensively eliminated any meaningful uncertainty, inflicting pre-emptive bans on every defense argument that had any chance of success. Many people have ordered Collateral Murder from us. YOU MUST have this DVD and show it to others. Get it now. World Can’t Wait has been pondering hard on what more we can do to create a political situation where Obama has to back down, release at least some of the men at Guantanamo, and be forced into closing the prison. The use of indefinite detention and targeted killing is an affront to generally recognized precepts of international law. Usually, the administration answers, as Eric Holder did last year, makes a claim that “we can do whatever we want,” essentially, when “national security” is at stake. Obama promised to close Guantanamo more than four years ago. We have been led to expect, over the last four years, that it’s really not that important to him to do so. But along comes the prisoners’ hunger strike — a dynamic factor neither Obama’s people, nor the millions of us outraged at Guantanamo’s continued existence expected. Their action could bring a possible change in the administration’s plans to maintain indefinite detention, at least for some of the men in Guantanamo. A major missing ingredient in this moment, though, has been the collective voices of artists, intellectuals, politicians, religious and cultural figures who are respected and beloved for being voices of conscience, speaking as one to demand that the torture of Guantanamo be ended. It’s time and past time, as more than 100 days of the prisoners’ hunger strike have passed, that we provide a way for them to speak out together, and for that message to be seen. Dennis Loo of Cal Poly Pomona drafted a message which will run this week as a full page ad in The New York Times this week which could serve as such a vehicle. Demanding “Close Guantanamo,” it has been signed by 1100, including John Cusack, Alice Walker, Wallace Shawn, Junot Diaz, Noam Chomsky, Daniel Ellsberg, Eve Ensler, Kara Walker, Dave Eggers, Glenn Greenwald, Paul Haggis, Bianca Jagger, Ariel Dorfman, Erica Jong, Michael Moore, Ron Kovic, Tom Morello, Mark Ruffalo, Coco Fusco, Peter Selz, James Schamus, Carl Dix, Oliver Stone, Cindy Sheehan, and Cornel West, joined by attorneys for the Guantanamo prisoners, law professors, clergy and academics. While promoting the message to Close Guantanamo that we are raising funds to publish in The New York Times, we have been hearing, especially in the Twitterverse, that people think, because Obama promised to close Guantanamo, and says that Congress is not allowing him to do that, the main problem is with Congress. It is quite true that the U.S. Congress, both when the Republicans led it under Bush, and since the Democrats took over leadership in 2006, has a shameful record in advancing all sorts of repression. Memorably, they’ve made speeches and passed resolutions — and tried to pass laws — saying Guantanamo, specificially, can’t be closed, nor can the prisoners ever by tried here or released in the U.S. So appealing to the right-wing Congress is going to continue to be a very hopeless road, absent the kind of mass political movement from the people needed, on all issues of justice, from authorizing un-ending wars, targeted killing, violation of borders for other countries, while further militarizing this country’s borders and infrastructure. Obama, however, as people rightly point out, has promised to close Guantanamo. For his own reasons, whatever they may be, he repeats what most of the world thinks, that the continued existence of the illegal prison in Guantanamo, set up to avoid U.S. law by the Bush regime, doesn’t serve the U.S. public image as the land of freedom and democracy. Not Congress, though they’ve done many other reactionary things. It was also Obama who in January 2013 closed the office in the Executive Branch run by Donald Fried, which was tasked with resettling the prisoners. 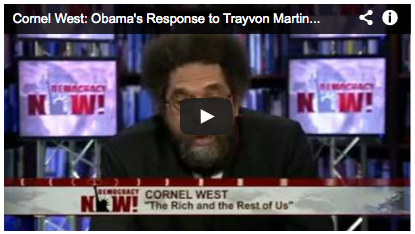 Obama’s credentials as a protector of the prisoners are non-existent, making his claims to fear for their deaths hollow. Yet, he should be held to follow through on his promise. You can read more on that in the text of our message. 3. Obama can use the clause written into the National Defense Authorization Act allowing the executive to release prisoners. President Obama seems quite ready to use executive authority when it comes to targeted kill lists. He doesn’t wait for Congress, or even acknowledge Congressional authority in matters of war and national boundaries for drone war or special operations. So why is he allowed to hide behind “Congress won’t let me” now? I would urge people who take Barack Obama at his word that he wants to close Guantanamo, to investigate more deeply what Obama’s policies have amounted to by reading Greenwald’s piece from 2012: The Obama GTMO Myth. “The best that can be said of President Obama’s performance on Tuesday is that the words he uttered can be used to hammer home to him the ongoing injustice of the prison, if he tries, as he has before, to lose interest in it. Mostly, though, what is needed is action — action to persuade Congress to drop its restriction on the release of prisoners, and action and honesty by President Obama himself: on his Yemeni ban, on the need to appoint someone to deal with the closure of Guantanamo on a full-time basis, and, if necessary, on releasing prisoners through the waiver in the NDAA. He also, as an urgent matter, needs to initiate review boards for 46 other prisoners who he consigned to indefinite detention without charge or trial in an executive order in March 2011, on the basis that they are regarded as too dangerous to release, even though insufficient evidence exists to put them on trial. That is, and was an unacceptable decision to take, but the only proviso that tempered it ever so slightly was the President’s promise to initiate periodic reviews of the men’s cases, which, over two years later, have not taken place. Obama needs to release the cleared prisoners, whatever work that takes; charge or release those being held indefinitely without charges, and close the prison. You can donate to help publish the ad. And sign it, along with the above writers, and myself. My friend Stephen Phelps, Senior Minister at The Riverside Church, signed The New York Times ad on closing Guantanamo we plan to publish next week, and sent a note saying he would “begin to send the hope around to some others.” This hit me strongly. For the last four+ years, since Obama promised to close it, nothing hopeful has come out of Guantanamo. The Obama Administration claims they are on a hunger strike because they want better treatment or better food. But that is not true. They are on a hunger strike because they want justice. They want freedom. They want to go home to their families. And this time they will not quit. This will be the last hunger strike. To stop eating is the only way prisoners can exert any control when they are powerless. But this time Shaker and the other prisoners don’t have the same strength, the same energy they used to have. Mentally and physically they are very weak. I am worried that something can go wrong, that someone will lose his life… Guantanamo is a concern to every human being who believes in democracy, who believes in human rights, who believes in the rule of law. We don’t have a lot of time. We need to come together to force President Obama to restore the rule of law and put an end to this disgrace. In the thirty-six hours since we debuted the ad text, and began asking people to sign on, circulate it, and donate for its publication, I’ve been very heartened by the comments and donations, from $5 to $1,000. The lawyers who represent prisoners are a group with every reason to have given up in defeat, since they are barely allowed to get to Guantanamo, and now their clients are visibly weakened, some unable to converse. They are signing on, and helping raise funds. Activists, artists, academics, lawyers, elected officials: this is an urgent call to you. Unite your voices together to support justice for the prisoners in the “newspaper of record” on the 100th day of the hunger strike. Publishing this ad will resonate in a way other actions don’t, and could help create a situation where the Obama administration is forced to respond. Let’s get into the streets around the world on May 17-19 as part of taking hold of the moment where how a society is measured comes down to closing Guantanamo, and gives hope that the war crimes this country has perpetrated can be addressed.